Just like everything else, popular engagement and wedding ring styles change over time. Although I still love it, my marquis diamond and yellow gold band is now considered “old fashion.” If you are recently engaged or almost-engaged and looking for the perfect set of rings, chances are you prefer “new fashion.” So, here’s the low down on the types of styles others are choosing this year. You can see examples of each in the image at left. One or more rows of accent stones around a larger one (or cluster of larger gems) creates more dimension and visual interest. One look and you can see why it’s probably the most popular style right now. If I were inclined to get new rings, I’d go for one of these. When I updated our rings section this year with the new styles, I noticed A LOT more diamonds actually in the bands. In years past, the sparkle was all at the top. Not any more. You can easily find styles with bling spanning the entire width of your finger! I really like this look as well because it makes the rings appear larger. Instead of the traditional, completely round band with the stones perched atop, these split to provide a double base for the setting to rest upon. 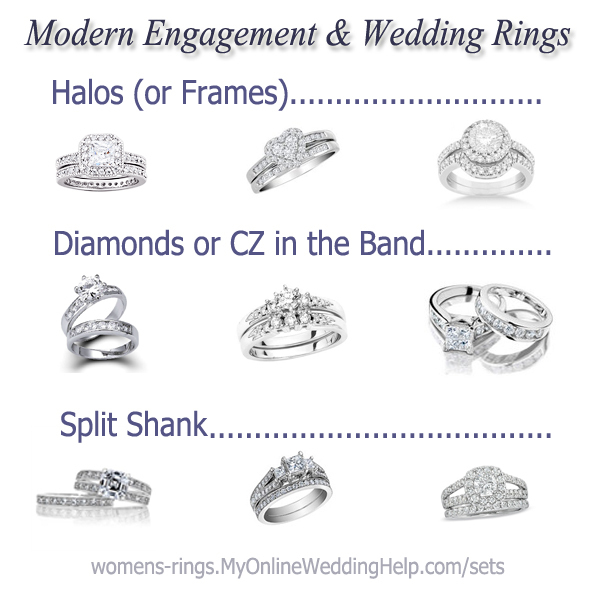 These ring sets are all from MyOnlineWeddingHelp.com partners. And since we all have different amounts to spend, I chose from different price ranges so you can see you don’t have to spend thousands of dollars to get a beautiful ring. In each row, the set on the left is made from CZ stones and priced under $100. Those in the middle cost $500-$2,000. The rings on right are $2,000-$5,000. You can find these, plus many others, in our Wedding & Engagement Rings Sets shopping section here. Prices and availability are as of 1/23/2013.